Dude, 1080p torrent is 54 GB. How the hell did it get so huge in size? My others torrents of 1080p animes are like 20 GB. Thank you very much for this serie I really liked it. @Trish: I really wonder why you come on coalgirls to say that. The reason I come here is to have those gazillion gb. And can anyone tell me how to register a user in Coalgirls? ‘Cause I know this web is based on WordExpress, but I cannot find where to register a user. Tenshi, what inspired you to make the video bitrate so high? Most encoders aim for a target file size with an “acceptable” degree of quality loss from source. My target is lossless from the source in every scene. As such overkill is better, anything that encodes to <50% of original size at crf13 I consider acceptable. 13 was the number I chose that IMO best represented my disired outcomes. Oh and speaking of the 1080p release. Many lines seem to have scaped TLC, when Ohana goes back to Tokyo and finds where Koichi works, the girl says Koichi-Kun, and you have it as Koichi-San(Episode 11 around 15:03). I did not write down any other as I just wanted to finish watching this (^_^”) , also it is our choice of where to get our anime from, I do not mind the size if it has better quality. Five years ago, such file size would have made me think twice. Now I don’t give a damn. I have plenty of storage space—especially because hardly anything per season is worth archiving these days. The 1080 torrent seems to be broken. I have tried other torrents (from this same site, mind you) and they all maintain a 300 kb speed average, but this one stays at about 50 but rises and falls like a rollercoaster without any seeds or peers coming or going. Up to 300, down to f’in zero, then back to 50 for about 5 minutes, then it does it again. If it’s not the torrent, then how do you explain what’s going on? There’s usually an average swarm speed of at least 240-300 kb…so frustrating. Huge size…… If possible, Tenshi, could you show me some pics about the details metioned above in crf13 plz? Upload to minus.com or other sites. Sorry to bother, but episode 12 of 720 is broken. Loads all but the anime stops at +/- 5:00, then VLC crashes. It’s the only episode that does so! This is quite easy to solve. What you want to do is uninstall VLC and then take a few minutes to create a proper MPC-HC setup. (Or use mplayer2 if you’re the *nix sort.) It should fix this bug. 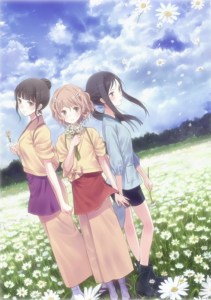 Are you planing to do “Hanasaku Iroha: Home Sweet Home” too? If so, I’ll definitely wait for your release.